The new One Bloor project that’s currently under construction at the south west corner of Yonge Street and Bloor Street, has just released new suite models for purchase. For a limited time they are offering a $10,000 discount off the top of the purchase price on any new release. 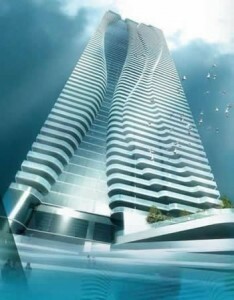 Designed by Hariri Pontarini Architects, One Bloor will rise to 70 storeys. Interiors are designed by Cecconi Simone. Developer is Great Gulf Homes. A large spa area with three treatment rooms, separate his and hers cold plunge, hot plunge, and jet massage showers, Laconium and Tepidarium steam suites, ice fountain and change rooms; outdoor terraces, lounges, a sculpture garden, bar, dining room, caterers’ kitchen, a billiards room; two pools: a year-round indoor and outdoor pool, beautifully landscaped outdoor terraces with fireplaces, spa/hot tub, foot baths, state-of-the-art fully equipped fitness cardio rooms, kinesis/Pilates room, yoga/spinning room & steam rooms. One Bloor will have a 24 hr concierge, and a resident superintendent. Silver Package (Standard Features for 1 + Den and 2 Bedroom City Suites) includes 9-foot ceilings; pre-finished engineered flooring throughout; gourmet kitchens with 27” Blomberg stainless steel fridge, 30” black ceramic glass cook-top, Built in 30” stainless steel oven, stainless steel microwave, 30” slide-out hood fan, Cabinetry custom designed by Cecconi Simone, choice of granite or Corian® countertop, Cecconi Simone-designed island with display niche, prep area in granite or Corian® and Corian® dining table. Gold Package (Standard Features for 2 Bedroom + Den City Suites) includes solar screen window coverings in kitchen, dining, living areas (as per plan); blackout screens in master and second bedroom (as per plan); Sub Zero 27” fully integrated fridge/freezer, Wolf 30” glass cook-top; Wolf 30” single self-clean convection built-in stainless steel oven, 24” dishwasher with stainless steel interior, stainless steel microwave, 30” slide out hood fan; 1st upgrade pre-finished engineered flooring throughout; approximately 9-foot ceilings. Platinum Package (Standard Features for 2-Storey City Suites) includes solar screen window coverings in kitchen, dining, living areas; blackout screens in master and second bedroom; Sub Zero 27” fully integrated fridge/freezer, Wolf 30” glass cook-top; Wolf 30” self clean convection built-in stainless steel oven, Asko fully-integrated dishwasher with stainless steel interior, Sub Zero 24” built-in 46-bottle wine fridge with glass door, Sub Zero 24” built-in fully integrated under-counter bar fridge/freezer; 2nd upgrade pre-finished engineered flooring throughout; rough-in for future window covering automation; and Introductory Home Automation System; approximately 9-foot ceilings. Maintenance fees will be $0.50/sq ft. Hydro will be metered separately. Parking spaces are $65,000 (Suites over 856 sq ft may purchase parking. Two parking spots are available for the two-storey suites). Lockers are $6,500 (Lockers are available for 2 storey suites). Occupancy is scheduled to commence December 2014.